So my last sewing vacation day I worked a little bit on the late 1790's dress, but I mainly wanted to start a new project! 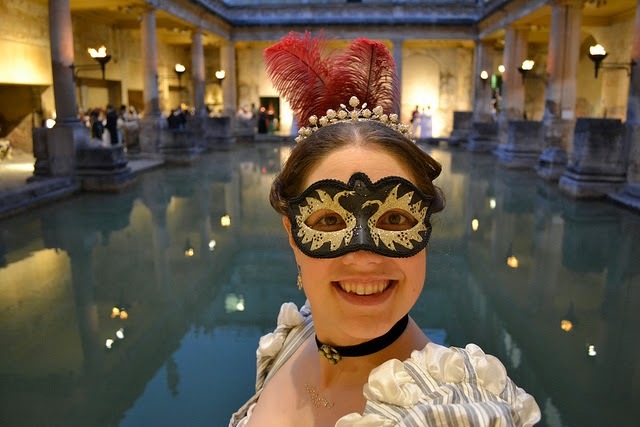 So of course I chose something that is 1) impractical and 2) have been planning for awhile...a black on black silk cape with black marabou feathers, using the same pattern I drafted for my earlier pink silk & white marabou feather hooded cape. I purchased the black silk taffeta in the L.A. fashion district a couple of years ago (now that I'm using it, I'll need some more black silk taffeta for another future planned project), and picked up the black linen from 96th District Fabrics at Fort Fred this past April, in preparation for this project! And I have some more black marabou feather boas on the way. 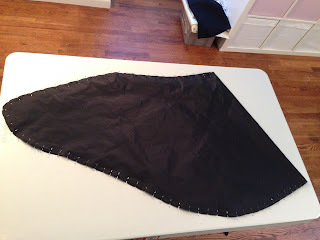 I cut the main cape piece on the fold, one of the fashion fabric (black silk taffeta) and one on the lining (black linen). Then I cut the cape hood piece, one of the fashion fabric and one of the lining. 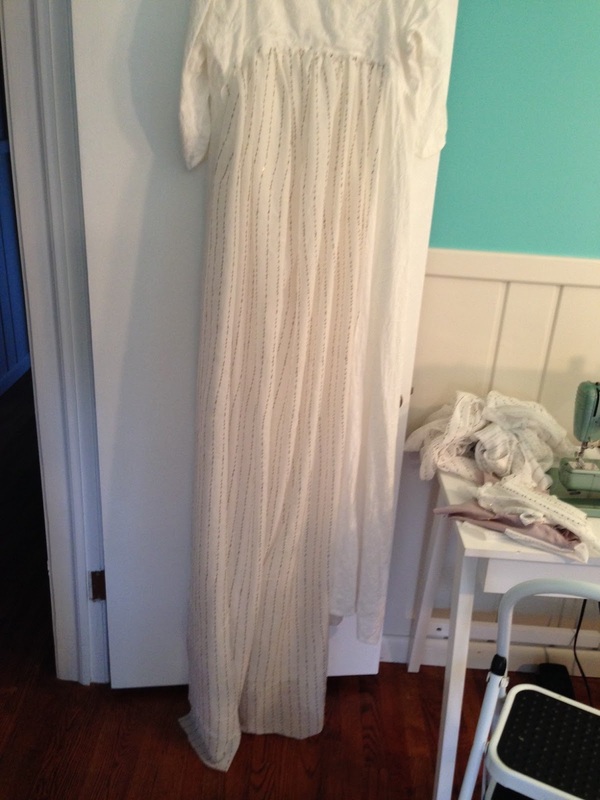 Then it's ready to start sewing together! 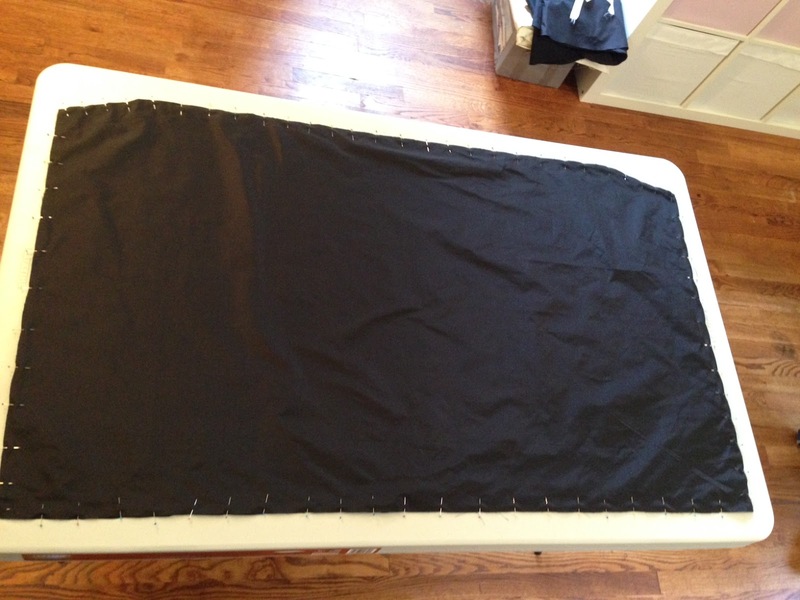 So far I cut it all out, pinned it together and then machine sewed a small seam allowance on the main cape and sewed it together to the lining. And so ENDS my sewing vacation! I was back at work on Thursday. And hopefully this weekend a bit of sewing and progress on this cape! The fabric I chose is a white with copper sequin 'stripe', very thin fabric (it burns clean so I'm guessing a silk cotton blend? It wasn't labeled) with tiny copper sequin spangles. I picked this up on super deal at Jomar in Philadelphia, PA a few months back. The fabric has a lot of flaws, a few holes, shredding near the edges, but the integrity of the fabric overall seems solid. So I got 13.5 yards on super clearance deal, and I ended up using pretty much all the yardage. 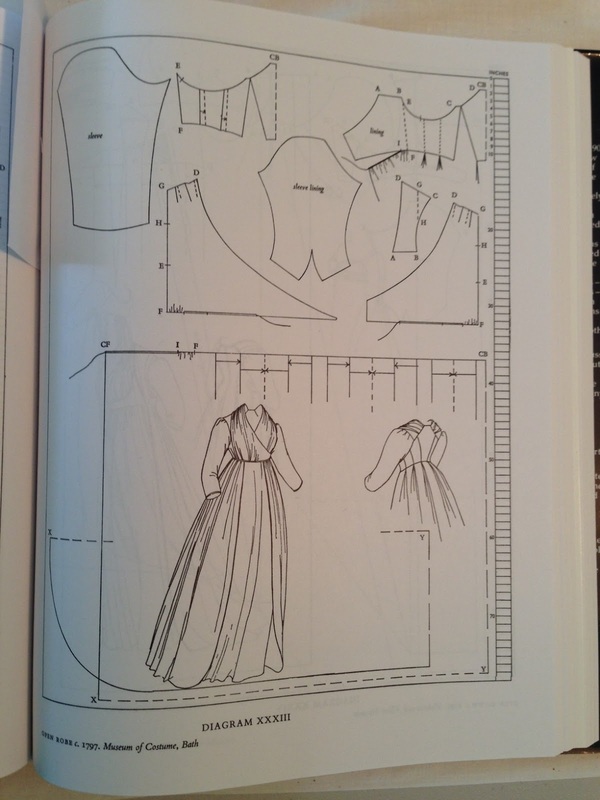 I decided to draft a pattern for this dress by looking at the general shapes in 'A Cut of Women's Clothes.' 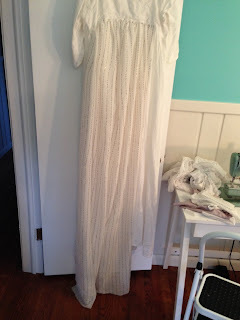 Since it is an open robe gown (basically a crossover gown) I grabbed my bodice pieces from my modified S&S crossover gown pattern, and then drafted and changed the shape entirely based on how the late 1790's waistline is lower than full Regency/empire style, so I made a long middle bodice back piece, a lengthened side back bodice piece that goes under the arm, and two front pieces (each had it's own unique shape) and then tried to draft a new sleeve, but ended up hating the fit of the muslin sleeve, so I modified my S&S long sleeve pattern for my first try at the bodice. I did a quick muslin mock up of the bodice and sleeve which fit pretty nicely so I started cutting! 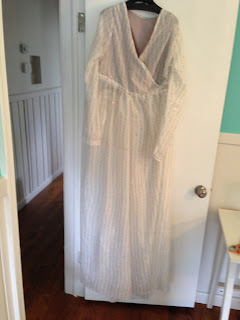 I draped the skirt panels by using my white embroidered cotton crossover gown as a faux dress form (I plan to buy one now that I finally have the room for one again! ), and added extra panels for extra fullness. 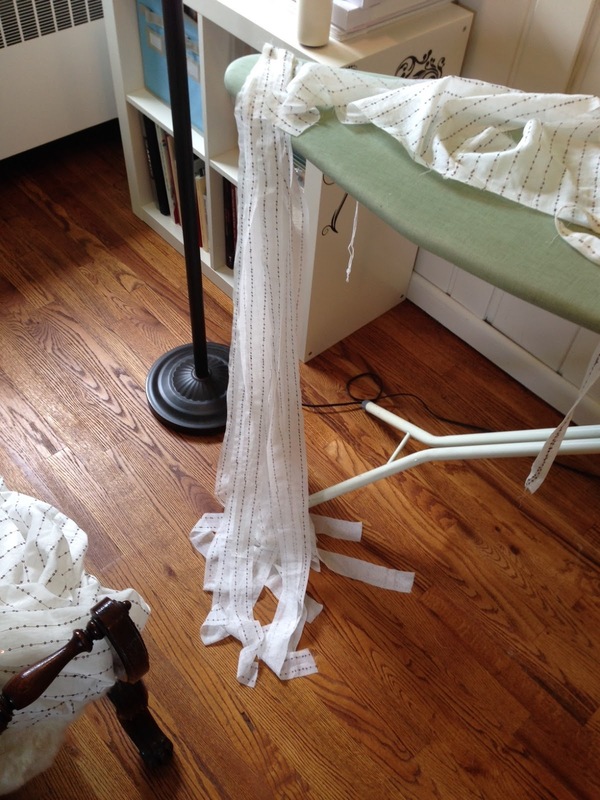 I planned to pleat all the extra fabric in, and the fabric is so thin, that I knew the extra fabric would not weight it too much. 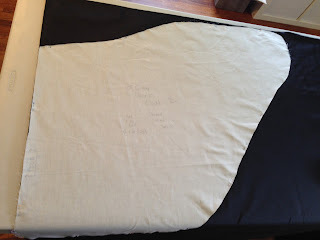 I ended up with too much fabric though (I do that sometimes) so I unpicked the seams where I sewed the bodice to the skirt panels, and took out a good chunk of fabric from each side. 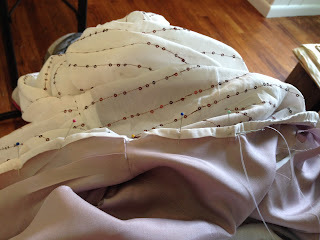 Then I re-pleated and sewed the skirt and bodice back together. I started piecing and machine sewing the gown together, but ended up with somewhat of a weird fit on the bodice arm sycles and sleeves and it made the arms too tight for good movement; so I cut down the arm holes and re-set the sleeves, but it was still not working right, so I paused to make a new mock-up, changing the bodice side back piece, but the fit was drastically different with the new muslin, and the earlier fit so much better. 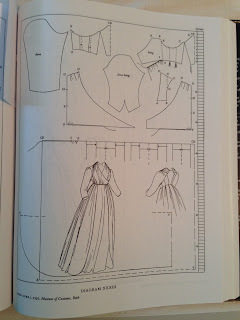 Making up dresses without patterns and without taking time to make full fitted mock-ups is difficult. So I decided instead to stick with my earlier drafted bodice back and side back pieces, which I liked, and instead just use my leftover fabric pieces to cut out the sleeves AGAIN, and before I did, I re-shaped the sleeves to add more fabric, re-shape the top, in order to get it to fit the arm hole correctly. Hooray, that worked!! 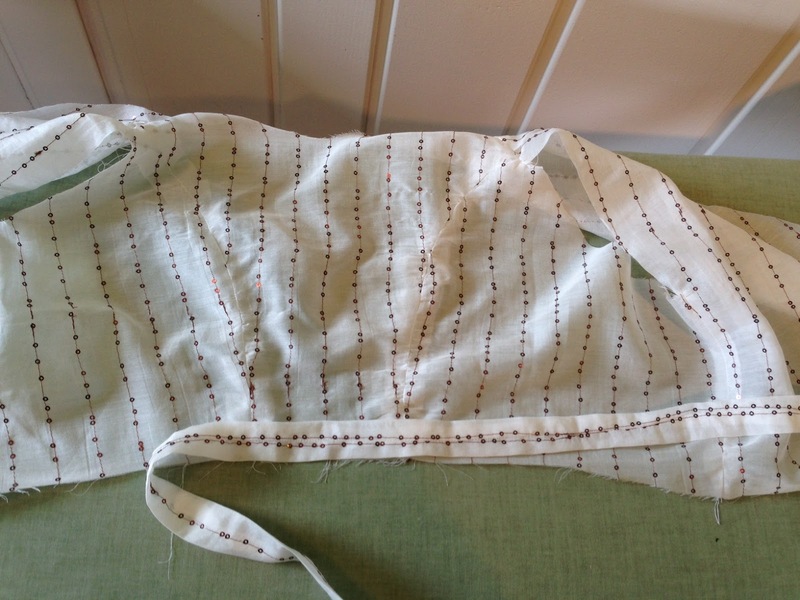 So in went the new sleeves and the outside part of the bodice basically done! 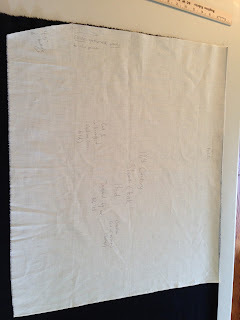 I already hand sewed this to the neckline edge of the bodice, and down both front pieces, and also to the sleeves to hem them, and then I made 6 more channels to go down the front sides of the skirt panels, and all around the hem of the dress (I cut the hem a bit short so rather than turn under to hem, I decided to make more channels to cover and finish the edges of the skirt). My HB was kind enough to help me turn the channels inside out while watching TV last night! 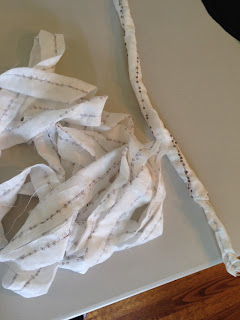 With so many yards of fabric, I had enough for the channels and braiding strips, and to cut out two sets of sleeves and still have some decent pieces left over, even cutting around the holes/bad edges, etc. 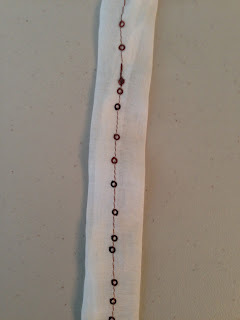 I am SUPER excited...I have sewing time coming up! 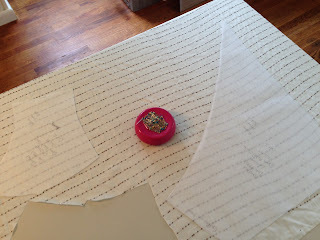 A little mini vacation to include some time spent on my new sewing room AND on sewing! 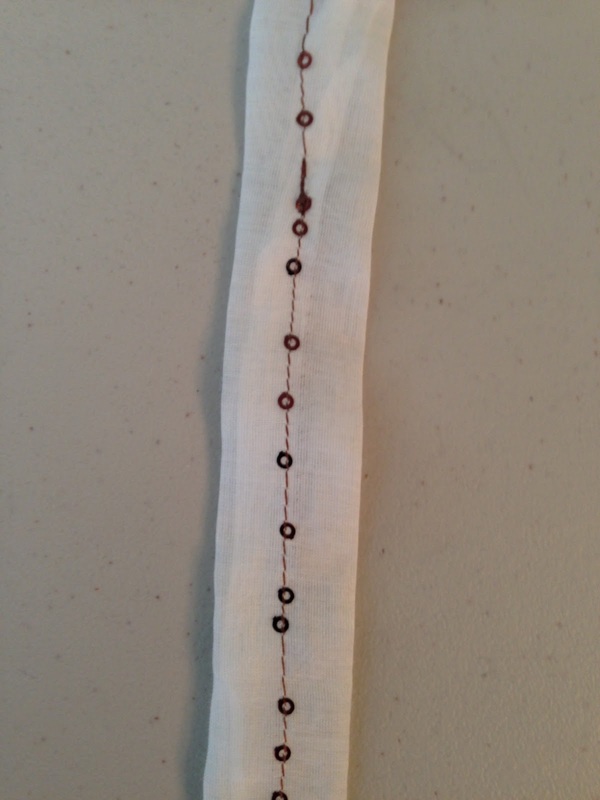 LIFE has gotten so in the way lately, that I'm happy to have time to do more than just a little bit of handwork. 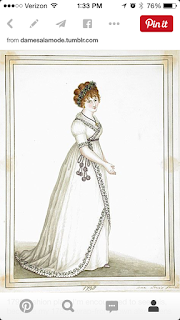 I'm planning on working on a new early 19th century ball gown for an upcoming Jane Austen Ball next month, and I have new fabric on its way for the purpose! 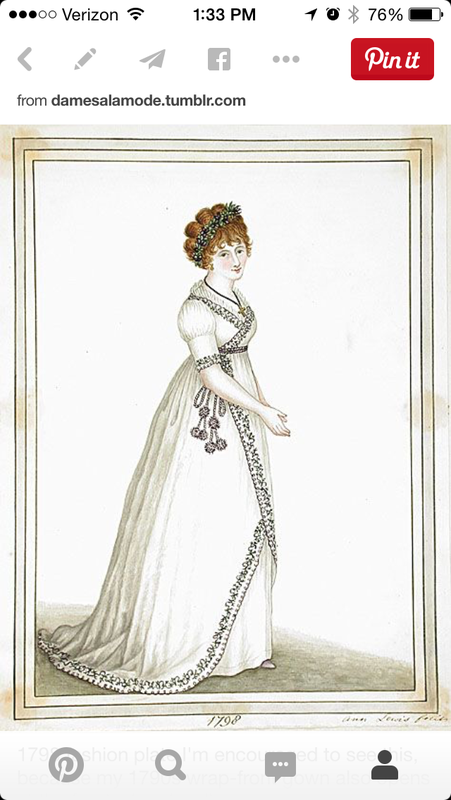 I'm in the preliminary planning and research phase for this new gown, but I'm planning an underdress of silk taffeta and a net overdress: I've been planning one of those forever and finally found the right fabric this week: wish me luck!